As a child I went to a ballet academy and followed ballet classes to become a professional ballerina. After quitting ballet school at the age of 16 I decided that I would rather go to university and study law. I became a lawyer that specialized in environmental law and worked for the Dutch Government and the European Commission in Brussels. When my children were very little I stopped working as a lawyer and after a few years I didn’t go back practicing law again cause I felt the urge to do something with art again. I was searching for the right form of art to express myself, so I wrote poems and started with photography—first as an amateur, but later as a professional, and gained recognition after winning a Dutch photo award. Although I loved taking pictures, especially portraits, somewhere during the end of the last decade I realized that I wanted to do something that was less technical and looked for more physical involvement and creative freedom. So one day I decided to buy paint and brushes and from that moment on I knew that I had found the right medium to express myself. I took different art courses and master classes for several years, but decided not to go to an art academy. I am quite stubborn and I wanted to find my own way and be more of an autodidact—self-taught. However, I am a member of a Dutch drawing group called the Hamdorff Drawing Club, which is a group of drawing professionals, some of them actually work as drawing teachers and we meet weekly to draw nudes. For me this is also an opportunity to study and to work on my drawing and painting skills. What are your inspirations? And which artists inspire you the most? Some of my favorite sources of inspiration come from the East as well as the West. The eastern aesthetics of calligraphy, art inspired by Zen and the abstraction of the Japanese Gutai movement are inspirational to me. It was an eye-opener for me when I found a book in an antique bookstore about Zen Aesthetics, Zen and the Fine Arts by Shin’ichi Hisamatsu. In this book the characteristics of art inspired by Zen are described and these are fascinating to me. 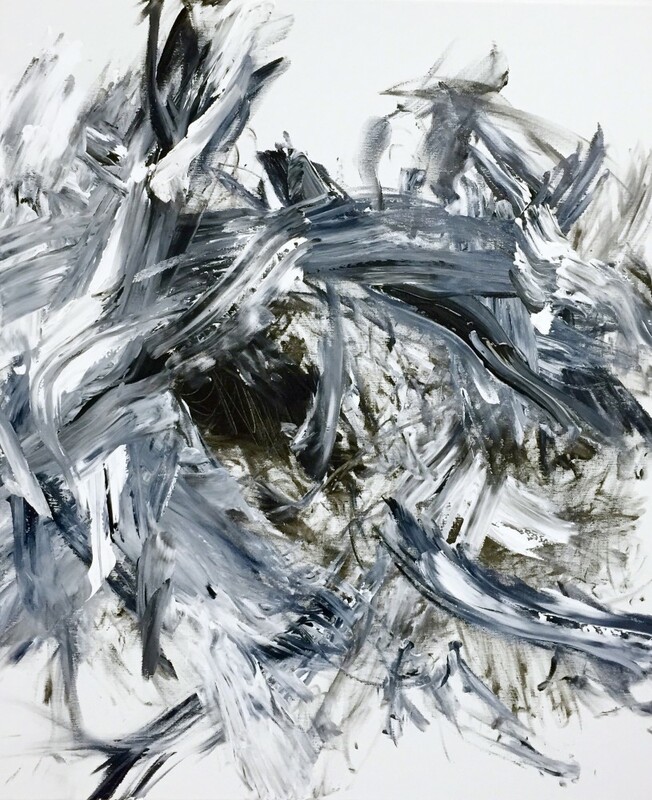 The artists of the avant-garde Gutai movement were attempting to create new art forms merging Eastern and Western culture, as well as the modern and traditional. They really focused on innovation and tried not to imitate artists, which I think is an important ideal. 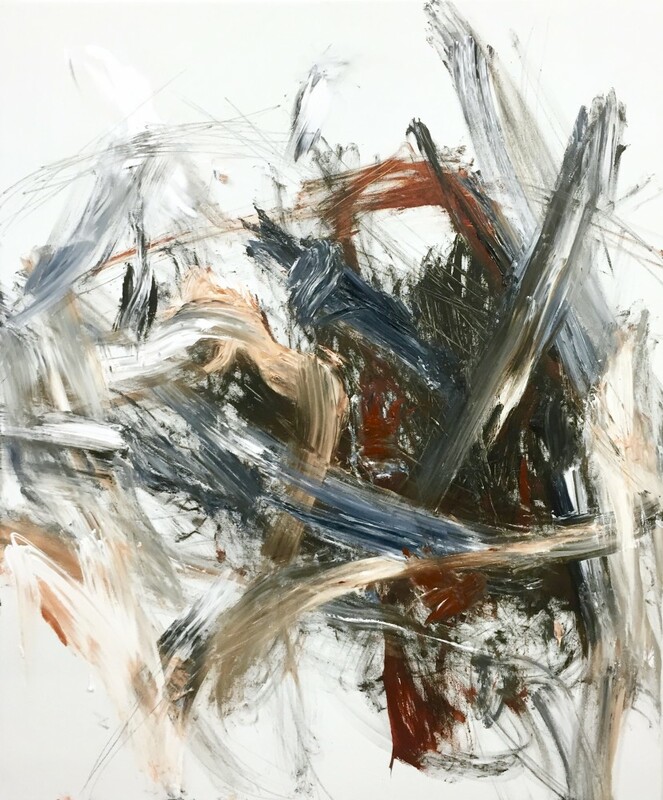 From the West several abstract expressionist artists are another source of inspiration for me, such as the American artists Cy Twombly, Jackson Pollock, Joan Mitchell and Willem de Kooning. I also admire the Norwegian expressionist painter Edvard Munch, who is one of my favorite painters. The more personal subject that is inspiring and challenging me as an artist is the fact that we as humans find it hard to live in harmony with our planet, more specifically nature and our environment. I feel privileged to be an artist, because to me it is the most beautiful and rewarding profession existing. But this privilege goes alongside responsibility. When I think of the ongoing conflict between man and nature, I think I have a task as an artist to act and do something about it. My role is to raise awareness of the existing problems that we are all facing. After having painted figuratively, mainly painting portraits and human figures, I discovered abstract painting. I am driven by intuition while working and I am searching for coincidences in order to reach as much spontaneity in a painting as possible. 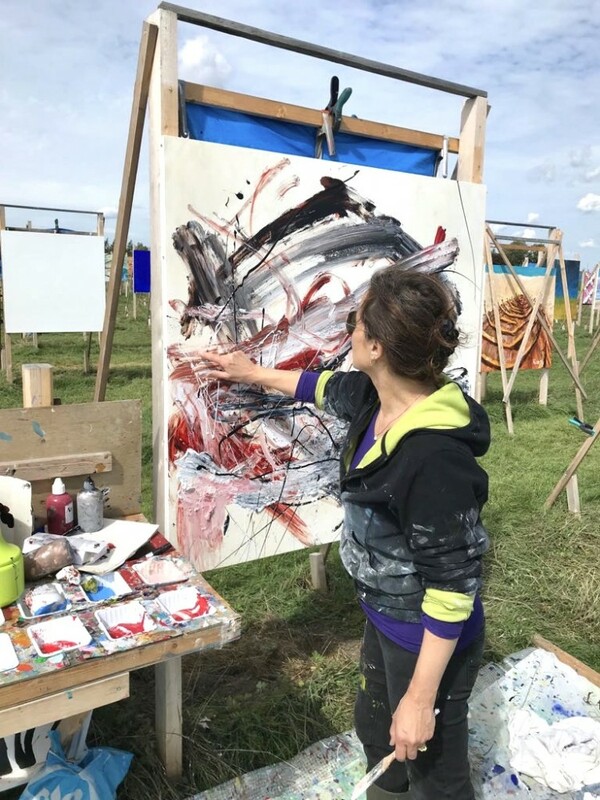 Furthermore I want to be physically involved in the painting process by also using my hands or arms to paint in order to make spontaneous and intuitive marks. When achieving a sort of energetic, spontaneous harmony I feel satisfied. If you want to search for a description of my style it is probably abstract expressionism, but the term lyrical abstraction is even better in describing the essence of my art. Maybe you can even call my art abstract activism, since I am aiming at consciousness-raising. Anyone can be a client, since my art is meant for everyone. But so far my clients have mostly been from the United States, secondly from Europe. However on social media I also have quite a bit of followers from the Far East. Recently I was approached by a Chinese online art gallery, and now they are promoting my art in China. I have done several art shows in Europe, in Milan, Brussels, Luxembourg, Stuttgart, Essen and Amsterdam. And recently I had a group show in New York at the Onishi Gallery, owned by Japanese gallerist Nana Onishi. It is the only Japanese-owned gallery in New York.